This week has whizzed by in a blur. I remember starting the week in the City of Glasgow – at a rock concert on Monday night – I’m not as young as I used to be so I’ll admit that it was Wednesday before I fully recovered! Since then I’ve been busily planning and booking tickets for The Festival of Romance weekend in Bedford later in the year, where I’ve now confirmed I’ll be attending as an author at the Saturday Coffee & Cake Event. Yay!! I’ve also booked a hotel and my flights from Glasgow to Luton and back, so I’m feeling rather pleased with myself for being organised so well in advance! You can find out about The Festival of Romance HERE. 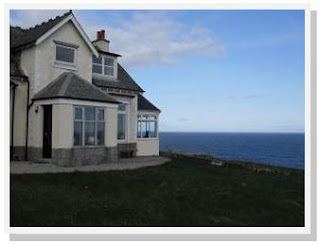 In the more immediate future - next week in fact - I’m planning to go up to Aberdeenshire to stay over and meet up with some of my Scottish Writer buddies at a cliff top cottage retreat. It really is as idyllic as it sounds. There we will writerly chat, a plotting workshop, a catch up on where we are all at with our writing at the moment, and of course wine. It will be blissful and wonderful! I’m also planning to have an online party later next month to celebrate the publication of my How To Party Online book and I will be outlining the details very soon – as at the moment I’m still in the plotting – erm, planning stages. But you know I love a party don’t you…?! Okay, I’ll let you in on what the theme will be. So I’ll be looking for photos of YOU dressed up in your party attire. Will you be in fancy dress, I wonder? (See below!) Will you at a fancy cocktail party? Will it be a wild hen party celebration? Or a very smart birthday party…? Me & Mr JH in '60's Hippys Fancy Dress Wear! Show us how it's done! Woo hoo! I love a good party! And you, Janice, throw some good'uns. 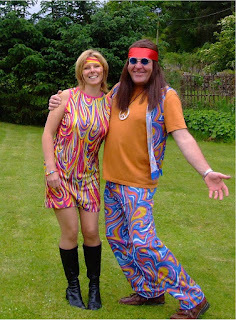 Love the picture in your hippy attire. I think I've got a couple photos to choose from. Looking forward to it - as always. It's not the wig I'm worried about... it's the vest top ha! ha! Hope it was polyester - the bonus was it was quick to dry! Can't wait - do I have any old photos....???? I do have a witch one...cackle, cackle, I'll see if I can dig it out! Love that photo! Look forward to catching up at CC.